1000mods is a psychedelic/heavy rock band from Chiliomodi, Greece. 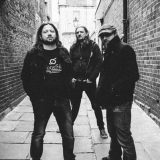 They were formed in the summer of 2006, and since then they have played over 300 live shows, sharing the stage with bands like The Black Keys, The Black Angels, Graveyard, Brant Bjork, Colour Haze and many more. They are known for their commitment to vintage equipment, thick and heavy analog sound and remarkably passionate stage performances. In October 2010, the almighty Billy Anderson visited Greece in order to produce the band’s debut album, while Malleus Rock Art Lab took care of the artwork. “Super Van Vacation” was born. In order to promote their debut album, they played 40 shows in 15 countries around Europe, including festivals such as Rockwave festival, B’estfest and Lake on Fire. After two successful European tours, the band was ready to get down to work again. Their experiences and growth paved the way for their upcoming album, “Vultures” which was released on the 30th of May 2014. 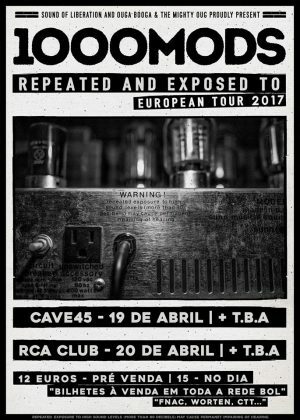 Two European tours followed with a massive two-month tour on October/November 2014 and a tour supporting The Atomic Bitchwax during May 2015. The time has come for 1000mods to get their effort to the next level. “Repeated exposure to…” was released on the 26th of September 2016, being their best album to date as well as an inspirational mixture of all that’s heavy in the glorious 70’s and the 90’s heavy rock movement. Having been recorded with hi-end outboard equipment in a non-stop 24/7 procedure, produced by both the band and sound engineer George Leodis and mastered by living legend Brad Boatright (the audio mastering engineer of Sleep’s “Dopesmoker”) “Repeated Exposure to…” sounds thick, beefy and tight, as a modern heavy rock album must sound. Not much later, the band departed for a 27-date European Tour with Monkey3 and Moaning Cities, participating in leading festivals such as Up in Smoke Indoor Festival In Z7, Desertfest Belgium, Desertfest Athens and Keep it Low Festival. The Greece/Cyprus leg of the tour followed, playing in 12 different cities with their big gig in Athens in January 2017 being Sold Out with more than 2700 people attending! 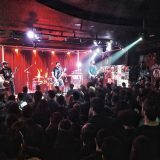 Their upcoming 2017 “Repeated and Exposed to” tour features a total of 42 live dates in 15 European countries, including –once again- appearances in acknowledged European festivals such as Desertfest London, Desertfest Berlin, Under the Black Moon Festival in Munich and Riff Ritual Fest in Barcelona.